WordPress: How to create left sidebar template in TwentyEleven theme? I’m modifying twentyeleven theme to have a left sidebar template for my page. By default twentyeleven have a sidebar template that showing the sidebar at the right column. To have a bit more choices for my new page, i would like to create a left sidebar template. Now open this sidebar-left-page.php using text editor and change the “Template Name” to “Left Sidebar Template” and save it. Now copy the content below and paste it at the end of functions.php file. Once the file is saved. 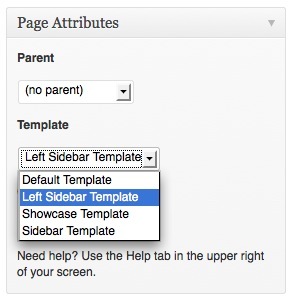 You may edit any of your page and you will see “Left Sidebar Template” as one of the option under “Page Attributes” -> “Template”. Try to select this “Left Sidebar Template” as the page template and save then do a preview and you should see the sidebar showing at the left column now!